Out-of-towners attending SXSW were disappointed on Saturday night, when local ride-hailing apps Fasten and RideAustin crashed. Marc Fridson of Brooklyn said he was worried about Uber's absence in Austin during the festival. Mel Roe was eating dinner Saturday night at Manuel’s Mexican Restaurant in downtown Austin when she nearly threw her phone at the wall. She said the app of one of Austin’s six fledgling ride-hailing companies, Fasten, would not let her request a ride. So, she relied on a technique used by many who’ve been stranded before her. After less than a year of operating in Austin, new ride-hailing companies faced their toughest test yet: the crowds and pouring rain that characterized the first weekend of South by Southwest. Ride-hailing companies Uber and Lyft left the city in May, after voters upheld city council rules mandating fingerprint-based background checks for drivers. At least two of the six new companies’ apps crashed Saturday night: Fasten and RideAustin. Fasten, with its official festival sponsorship, and RideAustin with its homegrown inception, are considered top local contenders. Early Sunday, RideAustin took to Facebook to explain its outage: “We were sporadic from 7:15 p.m. to midnight due to a previously undiscovered database issue that did not emerge during our scale testing.” The post goes on to say that RideAustin has now fixed the issue. Fasten COO Vlad Christoff confirmed that his company, too, had problems Saturday night, starting a little after 8. According to complaints on social media and several people interviewed, Fasten riders were also hit by rising prices throughout the weekend, which the company uses to incentivize more drivers to get on the road. One rider, Daniel Zen, who was visiting from New York City, was charged $105.93 to go 4.7 miles Friday morning. “The busiest time of the week in general, South by Southwest, pouring rain and our competitors crashed,” he said. He added that the company saw its ride requests multiply by 12. Both RideAustin and Fasten say their apps' crashes were spurred by the other company going down and having to absorb riders resorting to a plan B.
SXSW provides local companies, like Fasten and RideAustin, with an international stage. “South by Southwest is an incredible platform to launch anything new. It could mean to relaunch or go national where you might have been regional or local previously,” said Harlan Beverly, assistant director of the University of Texas Venture Labs. But Beverly said in order to capture an international audience already familiar with ride-hailing companies Uber and Lyft, these local companies have to prove they have something different to offer. But Art Olbert, a local tech investor, said the companies have demonstrated one important difference – compared to the biggest players, they’re friendlier to local regulation. “Austin’s not the only city who resisted some of the terms and conditions of the established players,” he said. “So that in itself could be a value proposition that the local players could use.” Both New York City and Houston have passed regulations that Uber and Lyft have found onerous. Both companies still operate in New York, while only Uber operates in Houston. Olbert and Beverly emphasized that Austin's ride-hailing companies' ability to harness South by Southwest's audience to expand to other cities is, of course, dependent on their ability to perform well during the festival. But a representative for RideAustin downplayed its desire to leverage SXSW as an opportunity to expand beyond Austin. (Fasten also operates in Boston). 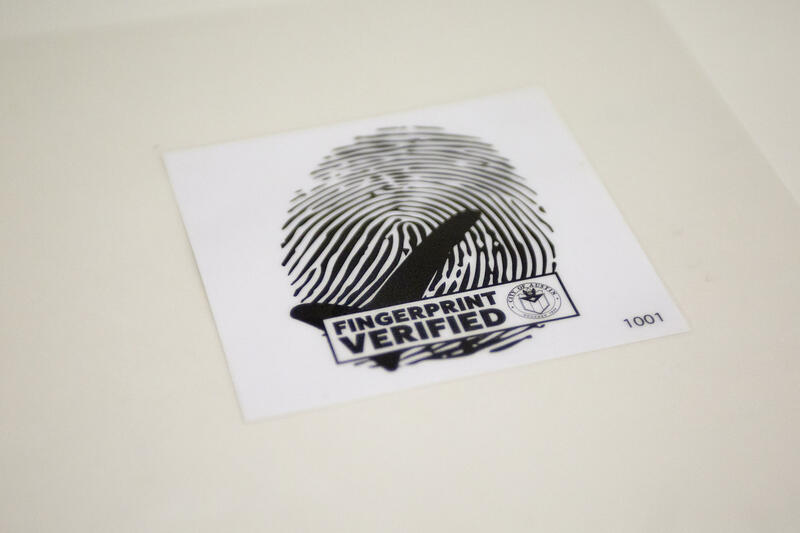 A decal signifying drivers are compliant with the city's fingerprint background requirement. “We’re very much focused on Austin right now,” said Joe Deshotel, RideAustin's community engagement director. Fasten, on the other hand, seemed more open to taking advantage of potential business prospects created by SXSW. Both companies said the problems customers experienced Saturday night have been resolved. This story was produced as part of KUT's reporting partnership with the Austin Monitor. Austin traffic can be crazy even on a normal day. And with SXSW upon us, we all know what that means for our streets. To make the festival more about music and films and panels instead of traffic-induced headaches, we made a list of a few ideas to help you get around Austin more easily and safely this SXSW. Researchers from the Texas Transportation Institute at Texas A&M University and the University of Michigan Transportation Research Institute want to know more about Austinites' experiences with ride-hailing companies before and after Uber and Lyft left town.